Fleeting bright scales. Sharks on the prowl. Majestic Rays Gliding in the wake. View Our Live Streaming Webcams! This unique encounter introduces our visitors to the reef environment in the best way possible, via immersion in our exclusive coral reef tank. Explore a living, breathing ecosystem with vibrant and alien lifeforms. Looking for things to do in Marathon on your Florida vacation? Interact with stingrays right in the water, and even get the chance to have a trained stingray rest itself on our your lap on our underwater-seated stingray bench for a uniquely personal stingray encounter! 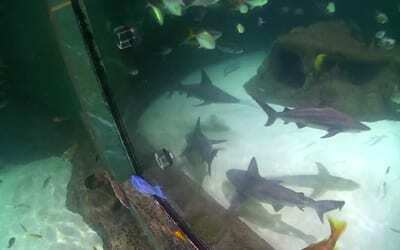 Get acquainted with our friendly gang of nurse sharks! In this interactive encounter, you'll be learning the methods of behavioral training used by our marine biologist to tame these curious creatures. You can even purchase memorable pictures or video of your tour! 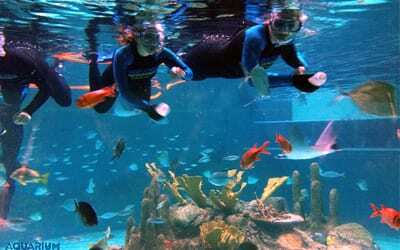 Family-friendly and educational, our unique exhibits are some of the best things to do in the Florida Keys. They feature thrilling attractions sure to inspire - and are included with admission! Enjoy some delicious meals with your friends, family, or group at our unique Eagle Ray Cafe! Serving beer, wine, and fun daily specials, come relax in our inviting tropical atmosphere. Find a fun variety of all sorts of tropical gifts for sale: t-shirts, rafts, bathing suits, towels, and more! Shop online for all your great Florida souvenirs perfect for any occasion. As one of the top things to do in Marathon, Florida we proudly offer the perfect backdrop for your birthday celebration, wedding reception, corporate event, field trip, & more! Create a memorable experience.